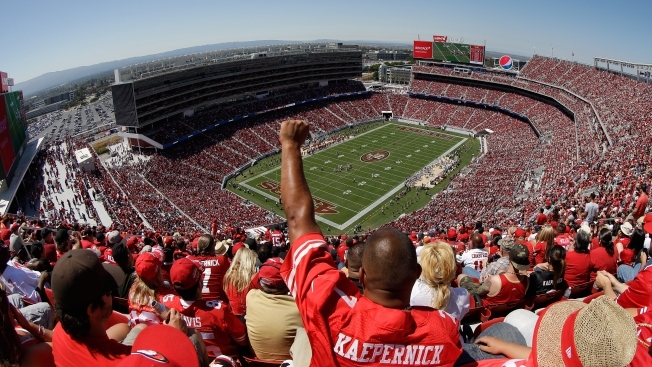 File image of San Francisco 49ers at Levi's Stadium. Kickoff is less than 12 hours away at Levi’s Stadium, but traffic and public transit impacts are expected long before that. The San Francisco 49ers are taking on the Los Angeles Rams at 5:25 p.m. in Santa Clara and VTA expects that roughly 6,500 NFL fans will take light rail and buses to the stadium. Of course, there will also be plenty of fans who drive to Levi’s. VTA lines 140 and 330 will be rerouted and commuters can expect delays on other routes. Santa Clara police expect heavy traffic between 2 p.m. and 9 p.m., with game day action expected to impact Highway 101, State Route 237, Interstate 880 and Lawrence and San Tomas expressways. Police have also worked with Waze to make sure that the app recognizes road closures and other event traffic management plans. People are also advised to not park in neighborhoods surrounding Levi’s Stadium.